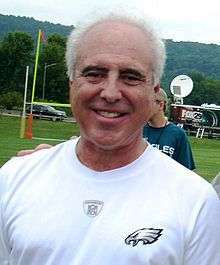 Jeffrey Lurie (born September 8, 1951) is the owner of the Philadelphia Eagles of the National Football League. Lurie was born into wealth in Boston; his grandfather Philip Smith founded the General Cinema movie theater chain. His father, Morris John Lurie, married Nancy Smith, the daughter of entrepreneur Philip Smith. Morris and Nancy Lurie had three children: Jeffrey, Peter, and Cathy. Morris John Lurie died on April 14, 1961, at the age of 44. In July his grandfather Philip Smith died. Jeffrey was nine years old. In the late 1960s General Cinema began acquiring bottling franchises, including a Pepsi bottling operation. General Cinema evolved over the years into Harcourt General Inc., a $3.7 billion conglomerate based in Chestnut Hill, Massachusetts, with 23,700 employees worldwide. In its heyday it was the nation's fourth largest chain of movie theaters, owned several publishing houses, three insurance companies and a leading global consulting firm. In 1984 Carter Hawley Hale was acquired, which was at the time the tenth largest clothing retailer in the United States, including Bergdorf Goodman and Neiman-Marcus. Lurie earned a B.A. from Clark University, a master's degree in psychology from Boston University and a PhD in social policy from Brandeis University, where he wrote his thesis on the depiction of women in Hollywood movies. He was born to Jewish parents but has spent his adult life as a non-practicing Jew. Prior to entering business, Lurie served as an adjunct assistant professor of social policy at Boston University. In 1983 he left academia to join General Cinema Corporation, a major film company founded by his grandfather, Philip Smith, and now headed by his uncle, Richard Smith. He worked as an executive in the company as a liaison between General Cinema Corporation and the production community in Hollywood. He was also an advisor in The General Cinema national film buying office. He then founded Chestnut Hill Productions in 1985, which produced a string of Hollywood movie and TV "bombs". On February 27, 2011, the Lurie-produced movie Inside Job won an Academy Award for best documentary film. The company also produced television commercials. As a fan of all the Boston sports teams, Lurie went to games and put himself to sleep listening to the Boston Red Sox on his transistor radio. The Luries had been season-ticket holders since the New England Patriots franchise was born in 1960, the year the American Football League was founded. Lurie cheered for Gino Cappelletti, Houston Antwine and Babe Parilli. In 1993, Lurie tried to buy the New England Patriots, but he dropped out of the bidding at $150 million when his uncle Richard Smith nixed the purchase based on the financials. Lurie's name also had surfaced in sale talks regarding the Los Angeles Rams, and he was a potential investor in a bid for a Baltimore expansion team with Robert Tisch, who subsequently bought 50% of the Giants. Five months later, Smith agreed to let his nephew buy the Eagles. Lurie contacted Norman Braman, then-owner of the Eagles. Lurie bought the Philadelphia Eagles on May 6, 1994 from Braman for $195 million. Lurie and his mother, Nancy Lurie Marks of Chestnut Hill, Massachusetts—Philip Smith's only daughter—borrowed an estimated $190 million from the Bank of Boston to buy the Eagles. To back the Bank of Boston loan, Lurie put up millions of dollars' worth of personal stock in Harcourt General and GC Companies Inc., as equity capital. Additionally, he and his mother pledged their stock in the family trust as collateral so Lurie could borrow the rest. "I am very excited at the prospect of acquiring the franchise and becoming a Philadelphian," Lurie said in a statement. "Philadelphia is one of the great sports cities in America, and I look forward to a long and successful relationship with the city, its team and its loyal fans." The club is now estimated to be worth $2.4 billion, as valued in 2015 by Forbes. ↑ "The World's Billionaires - #1472 Jeffrey Lurie". Forbes. November 5, 2014. ↑ Monte Burke (February 28, 2011). "Eagles Owner Jeffrey Lurie Wins Oscar, Joins NFC East Film-Buff Brethren". Forbes. ↑ Fox, Ashley (July 21, 2010). "Christina Lurie helped shape the Eagles vision". Philadelphia Inquirer. Retrieved 2010-12-21. ↑ Vinnie Iyer (February 28, 2011). "Eagles owner Jeffrey Lurie wins Oscar for 'Inside Job'". Sporting News. ↑ "The Business Of Football". September 2015. Retrieved 2015-10-20.